Coneflowers (Echinacea species) are native American wildflowers that have found their way into our gardens because of their stunning beauty and hardiness. 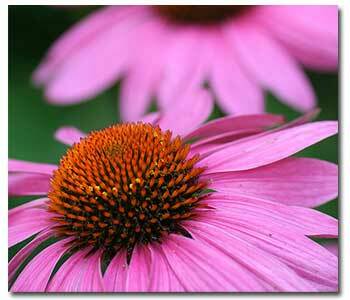 Originally only available in shades of purple and lavender, coneflowers now come in a wide range of colors. Thanks to the efforts of breeders across the country, they can now be found in shades of pink, white, purple, yellow, orange and salmon. They come in a range of sizes as well, from dwarf coneflowers that grow only 18″ high and wide to varieties that grow 4-5′ high and half as wide. The 3-5″ diameter flowers on these robust deciduous perennials are arranged above sturdy, elongated, upright stems that are perfect for cutting and last in a vase from 5-7 days. The flowers have somewhat weeping petals that surround a coned center (thus, the name) and are produced from summer into fall. Coneflowers prefer full sun locations and regular watering in well-drained soil that keeps them moist, but not wet. They require a couple of feedings per year of a good flower food to keep them healthy and strong. Coneflowers make an excellent addition to any perennial garden and also look great in border or container plantings. They are a perfect selection for butterfly gardens. We invite you to stop by and take some home today!